Kieran Jones is top of the Northants Premier Division bowling averages. 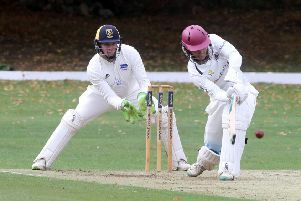 Captain Lewis Bruce blames himself for Peterborough Town’s likely failure to claim a fourth successive Northants Premier Division title. Town still have a mathematical chance of finishing top, but that would take an improbable collapse from unbeaten leaders Rushden over the final three games. Bruce is finishing the season in style, scoring 57 not out in last weekend’s seven-wicket win over Rushton at Bretton Gate, to follow his career best 124 against Horton House the previous weekend. On both occasions Bruce has opened the batting and he now believes that’s where he should have placed himself throughout the summer. “In hindsight I have batted too low at times this season,” Bruce admitted. “I finished last season in form when I was opening so I stayed there for the start of this season. “But when we batted second I found it mentally hard as I’d probably been bowling as well as skippering the side. “I probably should have stuck at it a bit longer because it’s the batting that is likely to stop us winning the league this season. “We have an outstanding bowling attack and only one team has scored more than 200 against us, but we’ve still lost three matches which is far too many. Town’s bowling strength can be seen in the current Premier Division statistics. Of all the bowlers in the top flight who have taken a minium of 10 wickets, the first four places are occupied by Town players. Seamer Kieran Jones, who is very much a back-up bowler and has taken just 10 wickets, heads the list followed by off-spinning professional Paul McMahon, paceman Joe Dawborn and Bruce himself. Dawborn has taken an outstanding 65 wickets, 10 more than the next-most successful bowler, his team-mate McMahon. Dawborn, McMahon and Bruce each claimed three wickets as Rushton were dismissed for 147 last weekend. They had been 94-2. Town aim to consolidate their second place in the table by beating Old Northamptonians at Bretton Gate on Saturday (11.30am).